I am using PHPEd for couple of months and I’ve recently upgraded to their latest edition, 5.0. So I cant resist myself from writing a review of this product. Latest edition of PHPEd (Version 5.0, build 5019) comes with many new exciting features, a splashing look-n-feel and improved debugging functionalities for professional PHP developers. PHPEd is available in the market for quite a long time and it is popular with handful of its useful features. The latest release of PHPEd improves their editor at next level where you will really find yourself flexible to develop PHP application. Let’s look at the best feature of PHPEd that always excites me. This is one of the coolest features which come to my everyday use. By splitting the code window in two parts I can simultaneously work on two portion of the same file, keeping anyone as a reference. The debugging in PHPEd is cool with DBG as the backend debugger. You can set break points, watch variables and do other things with it. Another feature I really liked is the different way of “code insight” – You can see the methods and variables inside your project. You can view all the classes, or all the methods under all the classes or even the methods from a single file. This thing helped a lot. And you can also search for any function inside your project using this code explorer tool. Yeah it’s true; it was so much fun having Firefox as the embedded browser. In PHPEd recent version you can use Firefox as embedded browser. PHPEd can write PHP code to interact with your tables. It creates the HTML form and PHP code for CRUD operation. PHPEd has built-in support for NuSOAP library for creating soap servers and clients. That’s another thing I really like!! Hit the Alt+F10 and just coding!!! – Very nice feature for me! That’s another very useful feature I agree, it comes very handy to perform shell operations. 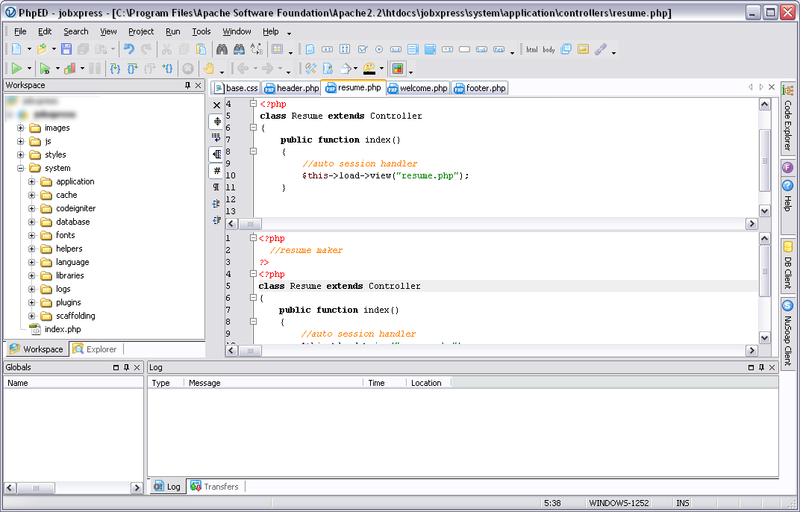 PHPEd interacts with shell directly from the project explorer. And beside these, yeah, code folding is also available. Yes, and that’s really nice. You can profile your application directly from inside PHPEd instead of setting up xdebug and WinCacheGrind. This is a very cool feature for PHP developers. Some drawbacks are there, too. One major problem that I face with PHPEd is that it has some problem with intellisense for some libraries like SPL and others. But they provide you some workaround to quick fix that. Another problem I found is old help files for Smarty, PHP and MySQL. But that won’t be a big problem if you have your own. “Splittable Editing Window” is a very essential feature I miss on other editors. Now I’ve to open another instance in notepad if I want to work on two portion of the same file simultaneously. Debugger and Profiler of PHPEd are among the bests in market. If you don’t need a fully blown IDE, but want the editor features, KomodoEdit is quite good. I stopped using it though when the demo period ran out. In spite of the fact that it’s a free product and that, at the time I downloaded it, the web site said there was no license expiry, it still expired after about 21 days. my first impression was that the new version is faster than the 4.x. Especially with large projects. Unfortunately some features are still missing (even thought they are on the wishlist for a long time). One of my most wanted is a keword-based todo-list (like in eclipse) and a grown up bookmark-system. But overall it’s a good release. It does seem faster, I agree. nice review and thanks to share with us. Thanks again for the good review! I’ve wondered if there has been an upgrade with this product. Does anyone know.